INDIANAPOLIS, Ind., May 3, 2016 – At both the 2016 Women’s Junior Olympic Level 9 Eastern and Western Championships this past weekend, 16 age-division champions were named, along with junior and senior team and super team champs. 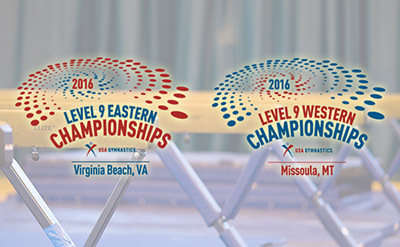 The Level 9 Eastern and Western Championships were the culmination of this year’s Junior Olympic Level 9 competitive season, and the Level 9 Eastern Championships were held at the Virginia Beach Convention Center, with the Western Championships at the Adams Center in Missoula, Mont. Region 5 was the Super Team champion, and Regions 7 and 8 landed in second and third. The individual all-around champions from the Eastern Championships are listed below. The Eastern Championships feature 16 age divisions, which were determined by birth date. The Eastern Championships included top gymnasts from Regions 5-8. The states that comprise each region are: Region 5 – Illinois, Indiana, Kentucky, Michigan, Ohio; Region 6 – Connecticut, Maine, Massachusetts, New Hampshire, New York, Rhode Island, Vermont; Region 7 – Delaware, Maryland, New Jersey, Pennsylvania, Virginia, West Virginia; and Region 8 – Alabama, Florida, Georgia, Louisiana, Mississippi, North Carolina, South Carolina, Tennessee. Region 1 was the Super Team champion, and Regions 3 and 4 landed in second and third. The individual all-around champions from the Western Championships are listed below. The Western Championships featured 16 age divisions, which were determined by birth date. The Level 9 Western Championships had the top gymnasts from Regions 1-4. The states that comprise each region are: Region 1 — Arizona, California, Nevada, Utah; Region 2 – Alaska, Hawaii, Idaho, Montana, Oregon, Washington; Region 3 – Arkansas, Colorado, Kansas, New Mexico, Oklahoma, Texas, Wyoming; and Region 4 – Iowa, Minnesota, Missouri, Nebraska, North Dakota, South Dakota, Wisconsin.